From the preface: "Sayce and Wright about forty years ago brought to the attention of those interested in Ancient History the forgotten empire of the Hittites. 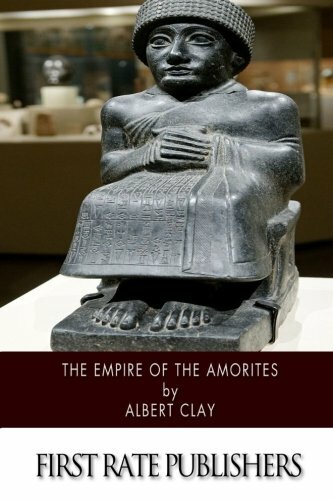 The study of the inscriptions of Egypt and Babylonia in the decades which preceded had made this possible by furnishing allusions to this people who came to the fore about 2000 B. C. Another nearly forgotten empire which exerted a powerful influence upon the surrounding nations, namely the Amorite, is also brought to light through similar investigations of the last few decades, largely in the cuneiform literature; but this empire belonged to the period just prior to the ascendancy of the Hittites. In Amurru, the Home of the Northern Semites, a study showing that the religion and culture of Israel are not of Babylonian origin, the thesis was advanced that the culture of the Semitic Babylonians had, if not its origin, at least a long development in the land of the Amorites before it was carried into Babylonia; and that the religion and culture of Israel were not importations from Babylonia, but developed naturally in their own land from an earlier and indigenous civilization. As is well known, there appeared in Germany about a score of years ago a vigorous school of critics generally known as the Pan-Babylonian or Astral-mythological School, which maintained that Babylonia had furnished the Hebrews with most of their religious ideas, including monotheism; in fact, the members of this school held that the civilization of Israel generally had its origin in Babylonia. Winckler, the founder of the school, endeavored to show that the patriarchs and other leaders of Israel, as Joshua, Gideon, Saul, David, etc., were solar or lunar deities of the Babylonians. Delitzsch called Canaan at the time of the exodus a domain of Babylonian culture. Gunkel held that Israel’s religion had assimilated actively this Babylonian material, and when it had become relaxed in strength, it swallowed the foreign elements, feathers and all. Zimmern found that elements of the Marduk cult were applied to Christ: even his death was suggested by that of Marduk and Tammuz. But the most extreme of all was Jensen, who found that all the biblical characters, from Abram to Christ, even including John the Baptist, were simply borrowed from Babylonian sun-myths."